Young Sara Walsh has a special ability; she can enter the bodies of people and amplify their abilities, particularly super humans. A power booster, Sara was abducted from her home by the Archangel Corporation's private military group and brought in for tests on the the potential her ability can do for their living weapons. The discovered that her ability gives no drawbacks to anyone using her, as she absorbs all the damage an overloaded person would normally take and with her healing factor, stay alive to do it again. This went on for years, until the Front Line, now waging a war with the Archangel Corporation, free her during a facility transfer. Rescued, the Front Line attempts to offer her membership into the group, yet Sara only wants to see her family, only to find out that the truth was, it was her own family that sold her to the Archangel Corporation. Betrayed and now having a reason to fight Archangel, Sara joins the Front Line under the code name, Boost, where the team implements her as a support/rescue operative and provide her asylum and treatments with the Loman Organization. Abilities: Boost has the ability to amplify another individuals abilities. This is achieved by her essentially shutting off the body's own limit controls in tandem with her own energy pouring into the subject to increase one's abilities exponentially. To prevent the physical and mental pain that would occur should an individual "overclock" themselves, Boost absorbs all the stress and pain into her own body and takes the hit for them. Her healing factor enables her to recover from these injuries, yet if she uses or absorbs too much, her body will physically shut down so that it can recover completely. Boost has also recently learned to use her ability offensively by "overloading" an individual by amplifying them to the point that they themselves pass out from the shockwave of pain, yet she still receives the pain backlash, albeit in a reduced capacity. 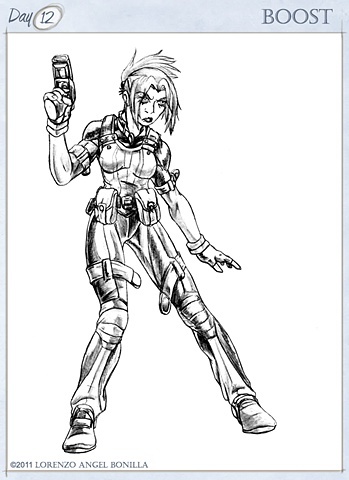 Creation: I can not take complete credit for the credit for the character, save for her design and name, as she was given to me by former owner of Brainstorm Comics, Robert Kimmons, as he told of a superhero character he used that would amplify other character's abilities, yet didn't have an explaination on how her powers would work. I supplied one based on Naruto's Guy and Rock Lee's own ability to release their own mental limits, and he offered to let me use the character for my own comic use. The offensive use of her ability came from watching Scryed's Scheris Adjani's Alter, Eternal Devote, used to deliver shocks of pain to an enemy, so I included it into her ability list. Her first name was actually based on a girl I knew in college and for a long while, her visual design was based on her, until recent as I had to draw this character from off the top of my head and I was also updating her attire for this challenge.